After Hurricane Sandy, Bonnie A. Harken, Architect, APA, co-chaired the multi-disciplinary, pro-bono Waterfront Working Group for the Post-Sandy Initiative of the NY Chapter of the American Institute of Architects, which was awarded the national 2014 AIA Institute Honors for Collaborative and Professional Achievement. 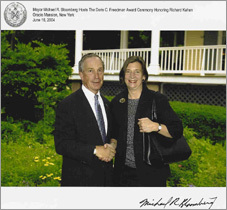 Ms. Harken served on the New York City Mayor&apos;s Waterfront Management Advisory Board, where she represented the NY Metro Chapter of the American Planning Association since it was convened in 2010 through 2014. Ms. Harken has been invited to speak widely in international forums, including at the United Nations headquarters on "Urban Waterfronts on the Front Lines of Climate Change," as the keynote speaker at the Korea Environment Institute’s International Water Symposium on "Waterfront Revitalization: Enriching the Quality of Urban Life," a World Bank Webinar on "Institutional Framework and Master Planning Case Study: Battery Park City," and during the UN Conference on Sustainable Development, Rio+20 at Studio X on "Mobilidade+Água" (Mobility + Water). As a member of the Board of Directors of the Working Harbor Committee in New York since 2011, Ms. Harken helps plan their Hidden Harbor boat tours and other educational programs. For over 10 years, Ms. Harken served on the Board of Advisors for The Waterfront Center in Washington, DC and co-chaired their Strategic Planning Committee. Fellow professionals acknowledged Harken's leadership in the field by selecting her to represent the American Planning Association’s 900-member New York Metro Chapter in the aftermath of September 11. She helped found New York New Visions, an award-winning coalition of 21 professional organizations, and co-chaired its Connections Committee, whose influential proposals for rebuilding Lower Manhattan with world-class transit have been incorporated into the official plans.